In August, IADC participated in the Canada – U.S. Energy Services Associations Meeting in Washington, D.C. Organized by the Petroleum Services Association of Canada, and also attended by the Candian Association of Oilwell Drilling Contractors, the meeting offered an opportunity for attendees to discuss NAFTA and possible changes to that agreement that could impact the energy industry in both countries. “The meeting was incredibly informative and timely with a robust discussion by those in the room on the reality of what, if any, changes to NAFTA would invoke for our industry. It also was an opportunity for IADC to continue to work closely with our sister trade associations, on an issue that could have a significant impact on the drilling industry, and is a topic that we will continue to monitor,” said Liz Craddock, IADC Vice President, Policy and Government Affairs, who attended the meeting on behalf of IADC. On 28 September a panel of the U.S. 5th Circuit Court of Appeals ruled against the government with regard to its attempt to exercise criminal enforcement powers against contractors and subcontractors. On 20 September, BSEE hosted a Public Forum on the Well Control and Blowout Preventer Rule in Houston. In a presentation at the Forum, industry was able to reiterate concerns that it had expressed during the initial rulemaking. These included provisions of the rule which were not cost effective or which could have unintended consequences that increased, rather than decreased, risk. Industry was also able to talk about its efforts to seek clarifications to provisions of the final rule which, notwithstanding efforts to with BSEE to resolve, have gone unanswered. These include provisions of the rule with an unachievable and unrealistic implementation period; unnecessarily prescriptive requirements on drilling margins that can increase risk; and requirements that exceed those of industry standards developed post-Macondo which require costly and unwarranted modifications for rigs in order to be qualified to work on the U.S. outer continental shelf. These concerns were similarly presented to the Administration in the form of a letter signed by IADC, API, NOIA, OOC, IPAA, PESA and the US Oil & Gas Association in May of 2017. The full contents of the letter can be found on IADC’s website. In the spirit of the Administration’s regulatory reform and energy policy agendas, IADC is hopeful that all of industry’s concerns will be addressed by BSEE in the near future. Congressman Steve Scalise (R-LA), who was shot in June while practicing for the Congressional baseball game, returned to the U.S. House on 28 September to resounding applause and thankfulness for his steady recovery. This month, the U.S. House passed a Continuing Resolution that keeps the Federal government open until December when it is expected that the FY18 government spending bills will be enacted. It also passed two Hurricane Disaster Aid bills and the Interior Appropriations bill, which included several other appropriations bills. Currently, the House is moving forward with a budget for FY18 and tackling tax reform. The House Natural Resources Committee is putting together energy legislation focusing on both offshore and onshore development. In September, the Senate passed the Department of Defense Reauthorization bill and approved several more nominees for Presidential-appointed positions. At the end of the month, there was an attempt to bring up legislation for another repeal and replace of the Affordable Care Act, but the Senate still does not have enough votes and it appears this issue may be dead for the foreseeable future. It is expected that moving forward the Senate will continue to process nominees and focus on tax reform and appropriations legislation. President Trump only issued one Executive Order this month, which provided additional sanctions for North Korea. In addition, two more rounds of NAFTA re-negotiation occurred, with the last one in Ottawa, Canada. NOPSEMA, the Australian regulator, recently opened a consultation on Draft guidance on qualifications for offshore medical personnel. The consultation is open for comment until 31 October 2017. NOPSEMA states that is has identified some operators employing, in the position of ‘Offshore Medic’, personnel who hold qualifications that are insufficient to competently deal with possible emergency medical situations. To ensure that operators are aware of their obligations in relation to this matter, NOPSEMA is proposing draft guidance on the topic. The purpose of the Guidance Note is to provide facility operators with information on appropriate qualifications for offshore medical service providers, thus facilitating compliance with their legislative obligations. More information can be found on the NOPSEMA website. On 19 September, the European Commission issued a press release announcing the 13 September release of the Cybersecurity Package for consultative review. The review runs through 16 November 2017. The Commission proposes to establish an EU Cybersecurity Agency that would have an operational role to counter particular threats, serve as a center of expertise on cybersecurity certification and support Member States in the implementation of EU legislation. The new body, if approved, will replace/augment the current Agency for Network and Information Security (ENISA) with a new one that could more effectively and efficiently support stakeholders efforts to ensure a secure cyberspace in the EU. The new proposed body would more than double the current budget and increase staff by 50%. It would also establish an EU framework for cybersecurity certification by creating a comprehensive set of rules, technical requirements, standards and procedures to agree to each scheme. Each scheme will be based on agreement at the EU level for the evaluation of the security properties of a specific information communications technology-based product or service. To read the full press release, please visit the European Commission website. 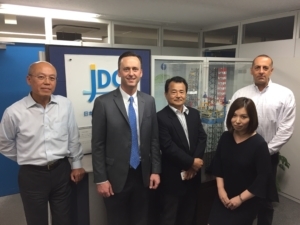 IADC President Jason McFarland visited Japan Drilling and Mantle Quest Japan in Tokyo in late August. Pictured are (from left) Shigeru Mitsuya, Representative Director and Vice President Executive Officer of Japan Drilling; Jason McFarland; Naoto Goto, General Manager – Safety & Environment Department for Japan Drilling; Erika Hashimoto, Chief – Marketing and Contracts Department for Japan Drilling; and Keith Kotval, Assistant General Manager – HSQE Department for Japan Drilling. PSA Norway recently announced that Lars Herbst, Regional Director for the Gulf of Mexico for the U.S. Bureau of Safety and Environmental Enforcement (BSEE), will attend the PSA on 5 October 2017, and will host a presentation on learning and prevention in light of the Deepwater Horizon disaster of 2010. The presentation is from noon until 2 p.m. An additional presentation will address Acute Emissions and Risk and Barrier Management. Registration is not required. API recently announced that registration is now open for its Exploration and Production Winter Standards Meeting. The meeting will be held 22-26 January at they Hyatt Regency in San Antonio, Texas. The program highlights include: Task Groups on Oil Country Tubular Good and Line Pipe; Work Group on Sour Service Products; Resource Groups on Coiled Tubular Goods; Threading and Gauging and Non-Destructive Testing (NDT); Well Cements; Drilling, Completion and Fracturing Fluids; Supply Chain Management; and Quality Programs. For more information and to register please visit the API Website. The Railroad Commission of Texas (RRC) recently posted its monthly drilling, completion and plugging summary for August 2017. The RRC issued a total of 1,125 original drilling permits in August 2017 compared to 660 in August 2016. The August total included 987 permits to drill new oil or gas wells, 14 to re-enter plugged well bores and 124 for re-completions of existing well bores. The breakdown of well types for those permits issued in August included 298 oil, 74 gas, 666 oil or gas, 64 injection, two service and 21 other permits. Also in August 2017, RRC staff processed 401 oil, 115 gas, 38 injection and three other completions compared to 545 oil, 223 gas, 46 injection and eight other completions in August 2016. Total well completions processed for 2017 year to date are 8,628; up from 4,830 recorded during the same period in 2016. According to Baker Hughes Inc., the Texas rig count as of September 8 was 455, representing about 48 percent of all active rigs in the United States. For additional drilling permit and completion statistics, please visit the RRC website. BLS Posts International Review of Injuries and Illnesses in the Workplace. The full article can be accessed via the BLS website. Visit IADC at LAGCOE and at the SPE Annual Technical Conference and Exhibition during October. LAGCOE, being held 24-26 October in Lafayette, La., features speakers including Scott Angelle, Director of the US Bureau of Safety and Environmental Enforcement (BSEE); and Randall Luthie, President of the National Ocean Industries Association. IADC can be found at Booth A56 in the Cajun Arena. ATCE convenes in San Antonio on 9-11 October. This conference is SPE’s annual meeting, and features a broad array of E&P technology and topics. IADC is at booth 1228. If you’re in town for either event, please drop by and say hello. For more information on IADC’s participation at these events, contact Loretta Krolczyk, loretta.krolczyk@iadc.org. Call for Abstracts for IADC Spark Tank on 6 December: Meet the Sharks! The IADC Advanced Rig Technology Committee has issued a call for abstracts for the ART Spark Tank, scheduled for 0900-1130 on Wednesday, 6 December, at IADC headquarters in Houston, Texas. The deadline for abstracts is Friday, 27 October. Presentations from the Q3 Drilling Engineering Committee Technology Forum, “What does ‘Prepared for MPD’ Mean?” are now available for download on the DEC website. The DEC is chaired by Keith Lynch, ConocoPhillips. The Technology Forum and a post-event lunch was graciously hosted by Weatherford at its Spencer Road facility in Houston. The Q4 Technology Forum will be sponsored by Baker Hughes, a GE Company, on 19 Nov, at BHGE’s facility at 3300 N Sam Houston Pkwy E in Houston. Lunch will be provided. The topic is “Extreme Drilling”. To register, click here. For more information about the IADC DEC, contact Mike Killalea, mike.killalea@iadc.org. The IADC Advanced Rig Technology Committee will meet in Amsterdam on 23 October, one day prior to the 2017 Advanced Rig Technology Conference, 24-25 October in the same city. The event will include a review of ART initiatives and deliverables, and foster a discussion of establishing a parallel IADC ART organization in Europe, among other topics. The ART Committee will subsequently meet on 30 October at IADC HQ in Houston. The BOP Controls Subcommittee is closing in on its goal of producing guidelines for shuttle valve qualification before the end of the year. The BOP Controls SC, respectively chaired and co-chaired by Roy Mills, Noble Corp, and Mitch Eichler, Parker Hannifin, operates under the auspices of the IADC Advanced Rig Technology Committee. The team, comprising valve manufacturers, OEMs, contractors, and operators at their September meeting further developed previous work on directional control and shuttle valve qualification procedures. The SC also developed the wording for the planned formal recommendation to IADC. Prior to the SC’s next meeting, the team will review the draft document and tweak the guidelines to conform with known API and IADC conventions to produce a cogent and useful document. IOGP Report 2016p, Safety Performance Indicators – Process Safety Events – 2016 Data. The report is a further step toward making Process Safety Event (PSE) data and associated KPIs available to all stakeholder. The PSE data presented in the report are based on voluntary submissions from participating IOGP member companies. IOGP Report 2016pfh, Safety Performance Indicators – Process Safety Events – 2016 Data – Fatal Incident and High Potential Event Reports. This report describes the fatal incidents and high potential events that were also PSE, and fatal incidents and high potential events that were PSE-related. Registration is required to download them from the ‘Data Series’ tab of the IOGP Bookstore. IADC’s annual media kit, the definitive guide to all products and services of IADC’s communications team. The DC media kit includes the editorial schedules for Drilling Contractor magazine and for eNews from DrillingContractor.org. The schedules include timing and topics for each issue. The media kit also provides details on DC circulation, and on the many marketing opportunities available through IADC. Some key items include excellent new high-impression online positions in our IADC Lexicon and the Microsites in DrillingContractor.org. In addition, we have scheduled three Virtual Panel Discussions on high-interest topics that are available for sponsorship. The media kit also covers IADC.org, DrillingContractor.org, DrillBits, 2018 IADC Membership Directory, and more. Go to www.DrillingContractor.org/mediakit. The media kit is also available as a downloadable PDF. For more information, contact Linda Hsieh, linda.hsieh@iadc.org, or Brian Parks, brian.parks@iadc.org. For sales, contact Bill Krull, bill.krull@iadc.org. Equation used for calculating flow in small diameter, low-pressure distribution lines. Pacific Drilling & Serivces PVT. LTD.: Pacific Khamsin (4). Sidewinder Drilling LLC: Sidewinder 103 (2); Sidewinder 110 (4).